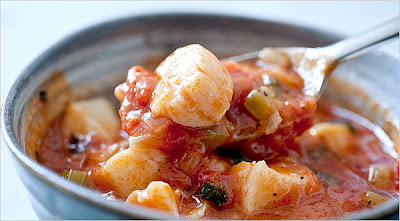 Mark Bittman does it again with Scallop Gumbo. I thought the scallops might be too mild, so I threw in shrimp also, but he was right. I found myself fishing out the scallops because the flavor was so good. This was my first time making a roux. My wrist was sore. My house smelled something serious. But the gumbo had a deep flavor, just like he promised. I suggest watching the video of Mark working his magic. Chopped fresh parsley, for garnish. 1. Put oil and butter in a large pot or Dutch oven over medium-low heat. When butter is melted, add flour and cook, stirring almost constantly, until roux darkens and becomes fragrant, about 15 to 20 minutes; as it cooks, adjust heat as necessary to keep mixture from burning. Add onion, bell pepper, celery and garlic and raise heat to medium. Sprinkle with salt and pepper and cook, stirring frequently, until vegetables have softened, about 10 more minutes. 2. Stir in the stock, tomatoes, thyme, oregano, bay leaves and cayenne. Cover, bring to a boil, then reduce heat so soup bubbles steadily. Cook for about 20 minutes or until flavors meld. Add scallops and cook until they are no longer translucent, about 2 minutes. Remove bay leaves. Taste, adjust seasoning and serve, garnished with parsley.